Just a mishmash of things because that's how life feels at the moment. Very mishmash. Like why won't this first line of text move to the left? 1. Power was restored here yesterday afternoon so whoohoo! 2. The hydrangeas everywhere you look are absolutely gorgeous this year. More gorgeous than other years it seems so maybe they love an Arctic winter. In times of transition it's so easy to get bogged down in the negative. I'm a naturally optimistic soul, but even an optimist can struggle with the in-between seasons of life. Hydrangeas are not small dainty blooms. They're big and bold and in your face, demanding you look up and take notice and most every yard in my mom's neighborhood seems to have at least one bush. When I see the huge bursts of blue and purple loveliness I remember that God is also big and bold...that if I just look up I'll see He's in complete control of where and how I bloom too. 3. I've been power walking the streets of my childhood most mornings and am reminded of how much I loved growing up here. Neatly trimmed lawns, the elementary school tucked right in amongst the houses, mothers pushing strollers and walking dogs. The sound of a mower and the scent of freshly cut grass. Does anything whisk you back to childhood quicker than the scent of freshly mown grass? I pass kids riding their bikes to the pool, and remember so well the freedom of my childhood. How I roamed these streets with one friend or a pack of ten, and how a summer day felt like forever. I'm so thankful for the safe place I called home, for the love and security I was given as a child, and for the freedom to grow up with wide eyed wonder and innocence. I know not everyone can say that and I don't take it for granted. 4. 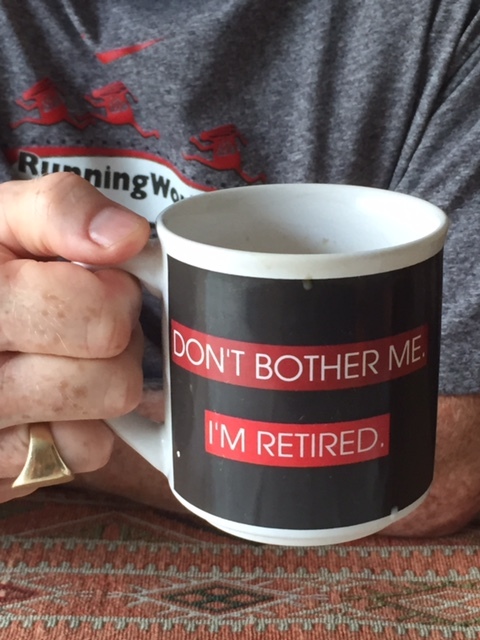 This mug belonged to my dad more than 20 years ago, and whenever we'd visit hubs would eye it with envy. Now he's totally legit. 5. My girl loves her some fro yo. I need to write about how I can't write, at least not in the way I normally do on this side of the pond. I have no routine here, I'm wearing the same thing every three days because our clothes are a disorganized jumble, paperwork is tucked into bags and pulled out in an attempt to get it together, and just aaaagh!! I'm a person who has always needed space and right now there isn't any. Not the literal kind or more importantly, not the figurative kind either. That's the one I really crave. I know it's a season and a short one at that. I also know there are lessons to be learned in the waiting, in transition, in time spent here at my mom's and I feel like I'm failing the class. Writing is sometimes just a dumping ground for the day's nonsense, but often it's the place I put my thoughts for processing and making sense of them. When you fall off the writing wagon it's hard to climb back on. Diving back in after ignoring my blog for a week at a time feels a little bit like joining a movie already in progress. When I write I tend to want all the parameters set perfectly in place before I pick up the pen (mouse). I'm realizing in this particular season that might not be possible. So here I am, writing a bunch of blobbityblahblahblah, and you know it feels good. Not as good as when I'm organized and clear headed, but it's a start and it's something and sometimes a less than perfect something is better than a nothing. Hang in there Joyce! You'll make it and just think what it's going to be like waking up every morning to look at that beautiful lake in your yard! I feel the same way about growing up when I walk through the park. Good memories, for sure! You should read my Thursday post. It was all about growing up on Old Cape Cod. Bless you for writing anything at all, Joyce! Lilacs take me back to my "home" and we don't have lilacs in Florida. I love seeing photos, but sometimes crave the scent. I was blessed with a warm, loving childhood too and don't take it for granted. Hang in there! Temporary inconvenience for permanent improvement!! The memories of your childhood took me back to mine. I remember the smell of freshly mowed grass and the feel of it on my feet. This might have been a mishmash of things in your mind, but for myself I could relate to everything you wrote. Sometimes disorganized thoughts turn out to be the best for your readers as in where it took me today. God is in control. I can only imagine how frustrating this stage of life must be for you, but I know that deep down inside, you know that it will have all been worth it when you are able to sit out on your patio overlooking the lake. Sometimes life is all about the blobbityblahblah! We write about where we are (emotionally, physically) and how we think. All the different slices of our lives. I know what you mean about falling off the blogging wagon, it's hard to catch up! I too can hear your frustration but know this is a temporary period until you get settled in a rental and then can follow the progress of your new home being built. New habits take a while to take hold and with all your upheaval you will be setting up new habits. I've no doubt that you will get there. Looking forward to following your journey. Bless you, Joyce. I know these are not the easiest of times for you, and some how you managed to still write a good blog post about it all! It's been a week of craziness, here, and sometimes I wonder will it ever end? Daughter's bank account (debit card) got hacked (and drained), son's house sale fell through just 5 days before closure, and my sciatica is back full force (still waiting 4 more weeks for my dr.'s appointment). Fun times...but I'm trying to look on the bright side. Awe, love the ice cream picture. I'm sure he's a bit out of sorts as well. Know you will be glad to get to your new location and moved into your rental. Can't wait to start sharing in your house building journey. So glad the electricity has been restored. That can be awful! I understand the desire/pressure to produce a blog post when it seems untimely or that there is absolutely nothing worth posting. Yet, many times, I find when I push forward, I can be my most creative. So keep up doing it for us regardless how blahblahblah they may seem to you. Just got back from a vacation to the Cape...our restaurant had power because they had a generator! Our motel lost power, again the day after for a few hours but it was about 7AM, so we went back to sleep! So glad your power is back on and it didn't take all week/weekend. Another blogging friend from not too far inland waited DAYS... showered at a friend's. So glad she had one! Friend, that is!